Buyer demand is still high in the Vancouver Island Housing Market. It has become typical to see multiple offer scenarios as buyers aggressively bid on the properties they want. It is VERY important to work with an experienced agent who has strong negotiating skills in this real estate climate. Whether buying or selling, Debbie Simmonds has the experience that will result in a successfully closed property for you! Read the full April 2016 Vancouver Island Real Estate Market Report. NANAIMO, BC – The VIREB housing market is firmly in seller’s territory, with buyer demand continuing to outpace supply in most areas. In April 2016, 662 single-family homes sold on the MLS® System compared to 449 last April, an increase of 47 per cent. Month over month, sales were up by 27 per cent from the 520 sales processed in March 2016. Last month’s active listings totalled 1,697, down 26 per cent from the 2,305 reported in April 2015. Cameron Muir, BCREA Chief Economist, states that the hot housing market continues to be fuelled by strong consumer demand. Buyers are aggressively pursuing home purchases, with multiple offers the norm rather than the exception throughout British Columbia. Real estate boards in the Lower Mainland, Chilliwack, Kamloops, the Okanagan, Victoria, and Vancouver Island are all reporting robust market conditions, with some areas posting record-breaking sales. Underpinning B.C.’s vibrant economy and strong demand for housing is employment growth of three per cent, the highest in Canada. VIREB President Margo Hoffman says that REALTORS® are busier than they have been in years, and multiple offers – particularly on single-family homes – are everyday occurrences. As stated in previous media releases, lack of inventory continues to be the major challenge for REALTORS® and buyers. Although the benchmark and average prices have risen over the past year, Hoffman notes that the VIREB market is still very affordable compared to Victoria and Lower Mainland communities. Whether you are a buyer or seller, Hoffman also adds that a REALTOR® is a vital partner in the sales process to ensure you price your home appropriately for selling and pay the right price when buying. In April 2016, the benchmark price of a single-family home in the VIREB area was $356,700, up 8.36 per cent from one year ago. 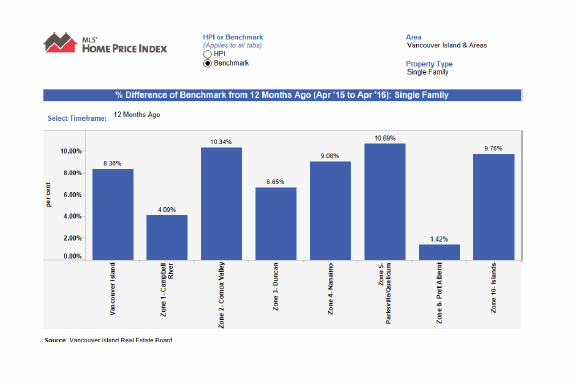 Benchmark pricing tracks the value of a typical home in the reported area. The benchmark price of townhouses and apartments also increased in nearly every market. The average MLS® price of a single-family home in April was $396,165, a nine per cent increase from April 2015. The April 2016 benchmark price of a single-family home in the Campbell River area was $284,600, a 4.09 per cent increase over 2015. In the Comox Valley, the benchmark price was $357,700, up 10.34 per cent from 2015. Duncan reported a benchmark price of $313,400, an increase of 6.65 per cent over the same month in 2015. Nanaimo’s benchmark price rose 9.08 per cent to $379,300 while the Parksville-Qualicum area saw its benchmark price rise by 10.69 per cent to $399,500. 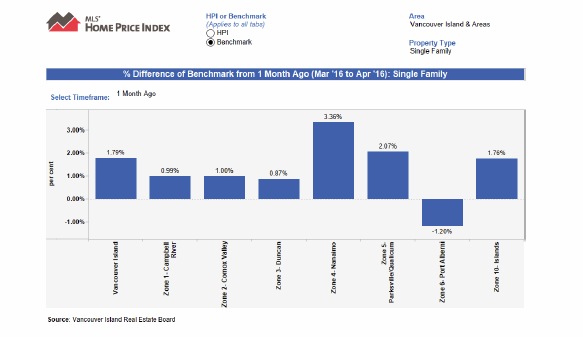 The price for a benchmark home in Port Alberni was $191,600, an increase of 1.42 per cent over April 2015. VIREB represents nearly 950 REALTOR® members in approximately 90 member offices on Vancouver Island (north of Victoria).